Thanks Sandra ;D It went really really well!! So hopefully I find out soon!! Hey Em Congrats on your job interview I hope it works out for you!! Eeek......periods, bloating, antibiotics, thrush, sinus.....just a lovely combo that every woman wants.. ...hope you feel better soon!!! Oh yeah it's been a fun ride the past couple of weeks battling all that!!! I also woke up with a cold on Tuesday too But that's almost all gone thankfully! I'm looking forward to feeling normal again!!! Sounds like you are doing well and I completely understand where you are coming from with the maintenance thing feeling scary. It's normal I reckon, but yes, having a game plan will definitely help. It will take a while but you will get used to the slight fluctuations as I have found keeping myself at an exact weight doesn't seem to work which is probably why I opted for an under such and such rather than exactly this or that. Even so it still takes some working out. I promise to write up my diary (I know, I know, I have promised this before but I will do it soon) and give you an update on the last 6 or so weeks which have been interesting regards maintenance control. Kim <------ is slacker for not doing diary! Best of luck on your job interview it sounds really interestng and I hope you are feeling better too. Great to hear from you!! Yeah I've decided that I just want to maintain at under 59kg, cos I blow up like a balloon at TTOM but I think I just won't weigh that week - it's just not worth it!!! Rightio, I think it's time for another update! Well I weighed in this morning at 57.3kg and 57.8kg... I got new scales I got some fancy body fat %/water % ones So I compared with my old ones and these ones say half a kilo less - WOOHOO I figure they're more accurate seeing as they're brand new, more expensive and do the body fat % thingie! I also found out my body fat % is 22.8% which I'm pleased about. For the longest time my body fat was stuck on 29-30% and I just couldn't shift it! So it has been a pretty crummy couple of weeks.. Work has been good, but I've just been flat out with everything - work, study, life.. I'm so tired and rundown, and as I mentioned in my "I'm yellow!" thread, I've gotten sinusitis again for the 4th time in about 3 months. I had it a few weeks ago, then once I got over that I got a cold, I got a few days peace and now it's started up again. This time I'm getting horrendous headaches, not just where my sinuses are but my whole head is throbbing, it's terrible. Which means my exercise routine has been totally up the sh*ts, scuse my french. Last week I skipped Wednesday night's class. This week I skipped Monday nights and am going to skip tomorrow nights classes... I just don't trust myself to do a Step class and not go flying over my step with my head feeling like this. But I'm not being too hard on myself, I've told myself that next week when I am feeling better I can throw myself back into it, especially seeing as I'll have more time.. 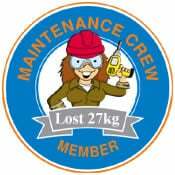 I think on the weekend I'm going to move over to the Maintenance area and set up a maintenance plan (forgive me, Sarah & Kim if I pinch ideas off yours!!!).. I think I'm ready!! I can't believe I've maintained for almost a month already!! The time has just flown. congrats on maintaing Em, that is great, I'm gald to see you are doing well with your student clinic course, well done..
That is great to hear that things may soon be back to normal for you Em you have been through a lot of ups and downs work wise. Will be good to see you over in the maintenance area and please pinch any ideas you like. It's still a learning process but the sooner you jump in the sooner you start figuring out just what works. Cheers everyone I sure have had my ups and downs work wise, Kim!! I Just want things to be settled for a while! Anyway, I woke up all excited and went to RPM this morning, and he was at the front desk reading something. I said hello to him and he kind of mumbled hello, glanced up and back down again and did a COMPLETE double take - he didn't even recognise me!! He totally freaked out, saying "Oh my god Emma, Where have you gone!? You're looking so hot, you are really looking slammin' good!" hahha, it was awesome Then during the warm up he just looked at me and went "I can't believe how much you've changed, Emma. You're slim, fit and fantastic!" - embarrassed me in front of the whole class But I loved it hahaha! Then I talked to him after the class and he just kept complimenting me, saying that I'd lost it in all the right places and I was going to be beating guys off with sticks etc etc.. It completely made my day - no, my entire WEEK!!! It means so much to me because he was such a huge inspiration to me when I was doing my Fitness course. It must feel that little bit extra wonderful to be so praised by someone you admire. I wouldn't call him hot, but to me there's just something about him.. And he's got a shaved head (was going bald at a young age!!) and I luurrrvvv that on a guy! !